Supply Chains for the 21st Century (SC21) is an improvement programme designed to accelerate the competitiveness of the Aerospace and Defence industry by raising the performance of its supply chains. 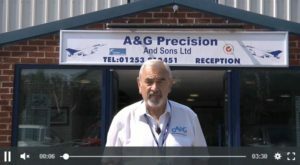 A&G manufactures a broad range of precision components to customer specification in a variety of metallic and non-metallic raw materials. Why did you choose to participate in SC21? The close synergy with the ASCE and SC21 approach enabled transition to the Manufacturing Excellence and Business Excellence evaluation process to be straight forward. It was a natural and logical next phase in A&G’s business development. What has SC21 helped you to achieve? Our SC21 gold award allowed for accurate positioning of A&G in the marketplace from external benchmarking of the business and manufacturing processes. The CSIP has delivered significant business benefits in reduced direct costs and in reduced processing times. New Quality Controls have delivered significant reductions in internal scrap, rework costs and customer returns. 5 year rolling strategic plan directly linked to growth plans and capital investment. The generation of a full suite of business and manufacturing KPIs has given significant visibility and focus with improved forecasting accuracy. Transparency of performance data with key customers has improved relationships and grown the order book. Visible dynamic shop floor electronic information boards ensures all staff are aware of current status SQCDP and support regular briefing sessions. Improved raw material and inventory management with reduced handling and over production costs. Structured sales and operations reviews directly linked to annual target, growth plans and KPIs. What would you say about SC21? The Denroy Value Offer: R&D, Component Design, Demonstrator, Qualification & Approval, Tool Manufacture, Component Manufacture = Advanced Materials & Manufacturing, Competitive Pricing, On Time In Full, Excellent Quality, Right First Time. We got involved in the SC21 programme to improve quality and delivery performance, reduce operational costs and to increase the company profile to other Aerospace, Defence and Security tier 1 companies. We have increased sales by over 30% whilst improving our trading profit. We have reduced scrap levels to under 4% and increased our usage of re-processed material with annual savings of £50+. Through supply chain management built on RelEx and RMM we have reduced our stock levels of raw materials, freeing up cash for investment. 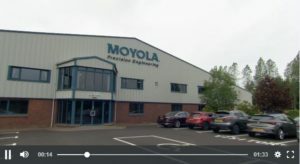 At Moyola Precision Engineering we adopt a team approach to delight our customers through the provision of complex machined components, assemblies and tooling solutions driven by the principles of the “Moyola Manufacturing System” (Lean House): “Right Part, Right Quality, Right Time, Right Cost”. We have been actively deploying lean practices and philosophies since 2000 and initially signed up to SC21 in 2007. We knew that this programme would drive and further improve the robustness of our systems and processes resulting in the ability to deliver on-time to an exceptional Quality Standard continuously to our customer base. The support of the primes and Tier 1 supply base and the recognition of receiving an award was an added benefit. TPM Programme has reduced unplanned machine down-time from 7% to 2.5%. “We have been actively engaged in SC21 for many years and use it as its main Business Improvement Tool for all aspects of the business. The change SC21 has made to our company has resulted in the evolution of a strong customer focussed business delivering in excellence to its customers, shareholders, employees and wider community. The wide benefits of SC21 have resulted in new customers and opportunities with existing customers that we would not have had without our many years of successful SC21 approvals. Wincanton is the largest British logistics firm, employing approximately 17,700 people across more than 200 sites and have a 3,600-strong fleet of vehicles. Wincanton provides strategic logistics for international defence contractors ranging from logistics consultancy and design services, to full supply chain management including operating transportation, freight-forwarding and in-country support hubs for production and through life support. Wincanton first got involved in SC21 in 2007, the reason why we originally got involved was due to a customer request. However we soon realised that SC21 could benefit the company as a whole and rolled it out across all our defence sector sites. SC21 has helped our company to continually improve and expand, allowing us to win new business both within and outside the defence sector. We strive to achieve excellence for our customers, suppliers and employees; SC21 has been beneficial in helping us on our journey. SC21 has helped us improve our processes and sustaining a quality performance of > 99.9% and a delivery performance of 100% for all of our customers. Being part of the SC21 community has allowed us to achieve a Gold standard site and to expand our operations working in partnership with multinational companies such as BAE Systems, Thales and General Dynamics. The CSIP process within the SC21 programme has continued to help us improve our performance in all sites through lean activities and the engagement of our employees. HS&E standards have been raised with a reduction in risk ratings across all areas, this has been achieved by improved 5s standards in line with the Manufacturing Excellence assessment. Overall I would recommend the SC21 programme to any company wishing to improve in all directions. The SC21 programme encourages companies to not only look at manufacturing, but also to look at leadership, their employees and their relationship with suppliers and customers. The SC21 assessments allow us to measure our performance in all these areas and allow us the opportunity to develop and grow with the support of the SC21 community. With approximately 76,000 employees at some 1,300 locations in over 100 countries, Kuehne and Nagel is one of the world’s leading logistics companies. Its strong market position lies in the seafreight, airfreight, contract logistics and overland businesses, with a clear focus on driving value chains and building a customer excellence culture through people, expertise and technology. SC21 was recognised as being complimentary to the Kuehne-Nagel Production System and would enhance their continuous improvement approach with new tools and methods supported by independent review and assessment. In 2017 with Leonardo’s encouragement two sites were signed up to the programme. It was quickly recognised that the outward facing supply chain elements of SC21 significantly enhanced their internal continuous improvement programme and consequently it is now planned for further appropriate K&N sites to join them on the journey to supply chain excellence. Our SC21 silver awards allowed for accurate positioning of Kuehne and Nagel in the marketplace from external benchmarking of the business and manufacturing processes. Abbey Forged Products is one of the UK’s leading forge-masters specialising in the manufacture of bespoke components for the Oil & Gas, Nuclear and Aerospace markets. The company has a six-acre manufacturing facility based in Sheffield, on site capabilities include sawing, forging, heat treatment, machining and both destructive and non-destructive testing. We participate in SC21 to improve and enhance our supply chain management using the EFQM business model. We also use the programme to engage our workforce in the tools to improve the ‘Lean Journey’. Our SC21 silver awards allowed for accurate positioning of A&G in the marketplace from external benchmarking of the business and manufacturing processes. Since participating in SC21 we have raised site OEE to 85%. We have developed a customer perception module for attaining an overall satisfaction score. In the supplier performance tracker we’ve raised our percentages in OTD and RFT. Dawnlough Ltd is one of the leading manufacturers globally for precision machined components and assemblies, both for quality and cost competitiveness. In 2018 the company is completing work on its new 50,000 sq ft facility. This gives us the scope to advance our skills and knowledge through greater investment in our people and new technologies. Through our focus on hard metals we have gained a global footprint in the commercial aircraft industry supplying the biggest OEMs across the globe. We joined the SC21 programme to improve internal business practices and be recognised in the aerospace industry for on time delivery and quality performances. We engaged in the lean programme to benefit from greater efficiency and improve tools on the factory floor for our workforce. Scrap levels have been reduced through increased quality standards. Customer delivery and quality performances have improved year on year since joining the programme. Since participating in SC21, we’ve won new business in commercial aircraft and are gaining new customers with major Tier 1’s. We’ve benefited from improved engagement with customers and suppliers through the RMM programme and moving to strategic partnerships.